The MetaTrader market scanner is a free forex tool that allows you to watch an unlimited number of currency pairs and time periods from a single chart. Gone are the days of opening so many charts that you can’t remember which currency you’re looking at. This free tool monitors moving average crossovers. It allows you to watch up to 30 different forex pairs simultaneously on 9 separate time periods: a maximum total of 270 simultaneous charts monitored from only one chart. You’re watching every moving average cross that you could possibly trade. Click on the Download Now button at the bottom of the page. Please review the instructions on how to load a Metatrader 4 indicator if you need any help installing the file. The zip in the download contains two files. The .mq4 indicator needs to go in the experts\indicators folder. You also need to place the DLL file in the experts\libraries folder. The inputs screen for the marker scanner displays a list of 30 blank spaces. 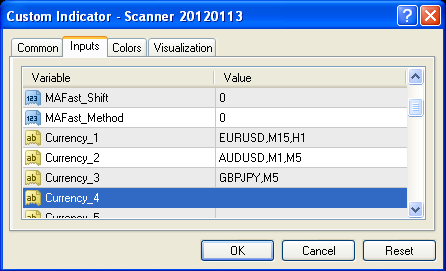 You must enter the currency information in a certain format for the scanner to know what to watch. The correct format is “SYMBOL,PERIOD,” just like you see in the screenshot above. If you want to watch more than one time period, then simply add a comma and the period code for every additional period that you wish to follow. The scanner will not function if any of the information is not entered correctly, although a pop up message warns you about any information that is incorrectly entered.